As my readers know well enough, this blogger stays away from that boring interstate. Instead, she finds herself often without a map on the narrow two-lane roads winding through the fabric of America. I just returned from vacation a couple of days ago and now with much needed rest, I am ready to share my adventures. My destination was Decatur, IL. Traveling with a baby, the scenic route is not always the most efficient choice. This time, I did take the faster route, but made one small detour: Route 66-Kansas. 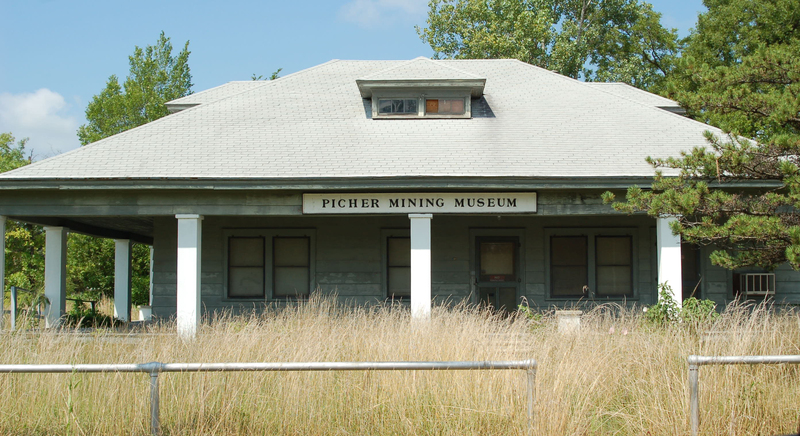 But this entry is about another little town with a very interesting story: Picher, Oklahoma. I had no idea this was even on the map. I wasn’t lost exactly but had become concerned because even though the sign said 69, I felt that I may have driven to far East. It didn’t matter. I figured if you drive north far enough, you’ll end up somewhere. And with that, I zigzagged on the 69 for a few miles and headed northbound crossing E30th Road. It was quite disturbing because there were only a few cars to be seen and about 4 or 5 adults sitting in the front of some empty storefronts. I’ve been through small very run-down towns but nothing quite like this. The large building to my right (in the photo below) looked like it had been hit by a tornado. I slowed down while no one followed behind allowing me to stop in the middle of the street to examine my surroundings and take photos. My heart raced. It was a very eerie feeling; rather startling. All the structures appeared to be empty and each one had a mark on the front of them–a number. Homes, business, a museum. Windows broken out, some flattened, but most left empty neglected by society. If my baby was not with me, I would have spent the rest of the day exploring this discovery. The day was bright with clear blue skies. A more appropriate day would include some large thunderheads hovering in the background in late day. One would not be wise to venture out alone either. Perhaps you would want to join me. The first building in view driving north into town. Surrounding the town are these lead slags left from lead and zinc mining. I think this is the same town my brother-in-law took us through. From what he told us and the girl at the front desk of the Microtel in Miami, Ok told us. It was an old mining town with toxic trailings so the state or someone was trying to buy out the whole town. Her parents sold. Then a tornado hit the town about 2 years ago. She told me her grandparents still live there. It most certainly is. I would really like to drive back up there. Margaret, you are right, the government did buy out alot of people and there was relocation assistance. A tornado in recent years flattened once side of the town and what I’ve been told there are only a few people still there. A most interesting story it is. I am not sure that is a dune – it look more like a mining slag heap. Thanks Pastor. I made the correction. Wow …deserted towns are interesting. You know there are parts of Detroit becoming the same way. Nice post. The world through your eyes takes me to several places I would have never dreamed about. I would like to use one of your photos of clouds, and wanted a) your permission and also b) to have your name for proper crediting. No idea where I found it, but you shot up into dark clouds. Good shot. I selected it from many. I am using it in an electronic presentation. I can send it to you if you want, maybe you’d know the link, so I can include it. Anita, there’s a town in eastern MO on old rte 66 that was evacuated in the ’80s I believe… It was due to a toxin spread on the gravel/dirt streets to keep dust down. Town’s name- Times Beach, MO. Near St. Louis… It is now a rest area/park with a museum. I guess most of the toxins have been cleared out (and I think they found out it wasn’t as bad as originally thought). Most of the original homes/buildings are gone. Thanks S for that. Seems like there are quite a few towns in this part of the nation with similar catastrophe. 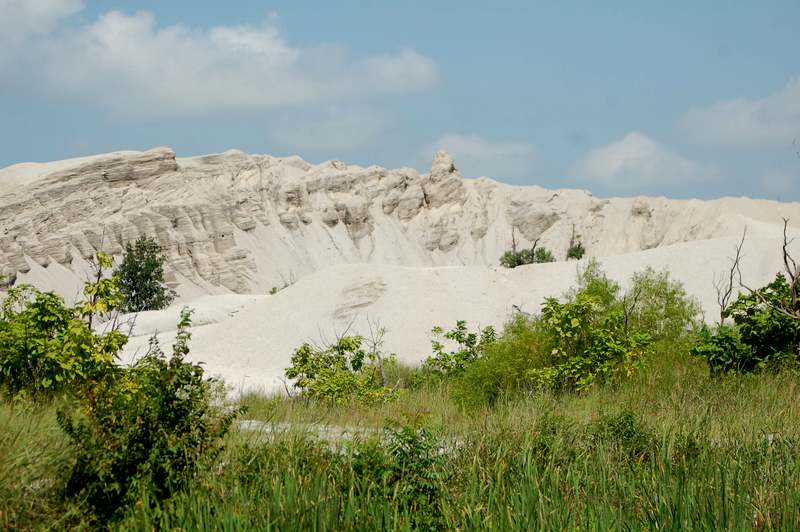 When I was living in Picher for the 1st 7 years of my life, we called those slag heaps “Chat Piles” We would climb them and a few were so large that you could drive up on them. I spent a few years shooting fireworks on those chat piles. We moved away but came back to visit for several years. It was after we moved that they began to have cave-ins. The last I heard there were about 35 or 40 people still living there. They just don’t want to give up on Picher. They have lived there all their lives. I really enjoyed your article. Here is a short virsion of my life in the area. I grew up in the Quapaw/Picher area. The “chat piles” were a place for younger folks to climb, race motorcycles, dune buggy races and on most weekend nights we would build big bonfires and have big parties. Then came the big lead contamination in the soil and water. We weren’t allowed to go onto the chat piles any more, all the soil around town and homes were contaminated. The government came in and said the town was being closed down and the people were going to be removed. I have family and close friends who have had to leave homes their familys had built during the birth of the Picher Mining days. A lot of us have a lot of fond memories. 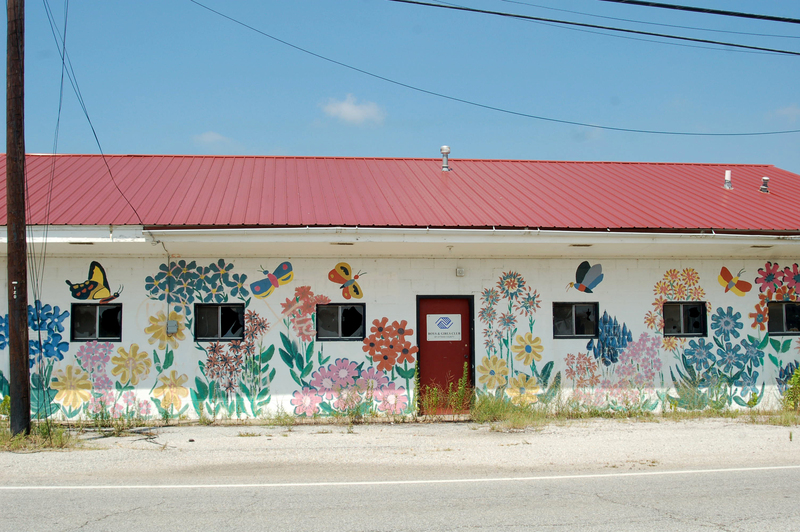 Check out the Flickr photostream of shots from Picher. I think you’d enjoy a lot of our shots. It’s a truly unique place. Dan thank you for your link. I had been there (your page) and appreciate your images. Julia, my heart hurts when I read of the lives so drastically changed by what happened in Picher. 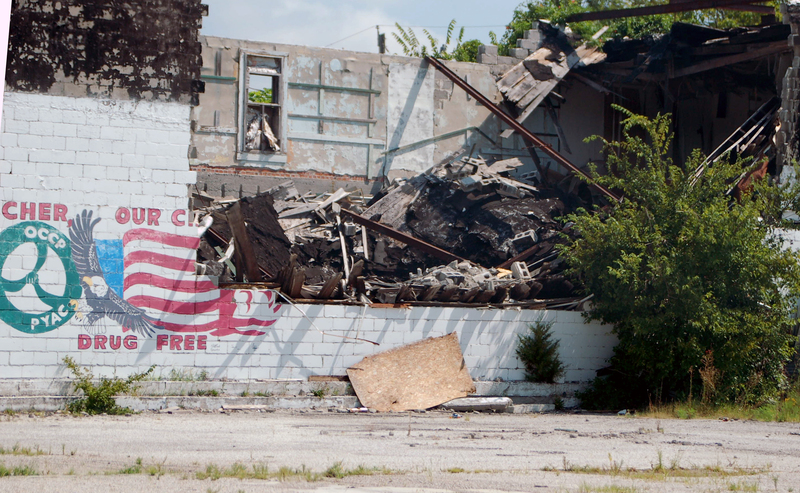 I’ve been back since I wrote this entry and much of the town is being demolished. I thought about that to….it’s being restored to what it should be.